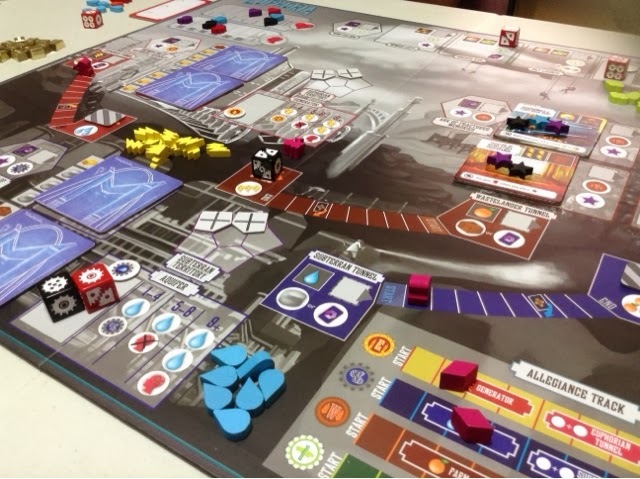 Euphoria is a race game where players are trying to stamp their authority all over the Dystopia. This is represented by 10 star pieces that players will have to put on the board to win the game. This is mainly achieved by the exchanging of resources to build markets, to power faction levels, and to outright exchange for star placement spots in the different faction areas. In short, this is a standard worker placement and resource management game. 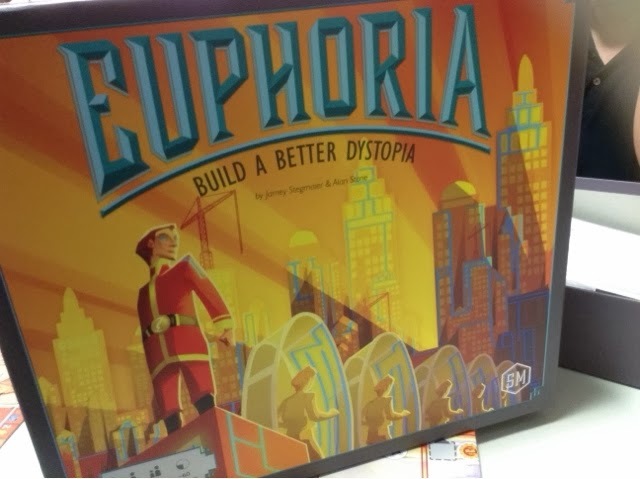 Euphoria does change things up slightly so as to move away from a standard worker placement game though. This is achieved by the workers being represented by dice with regular dice values. 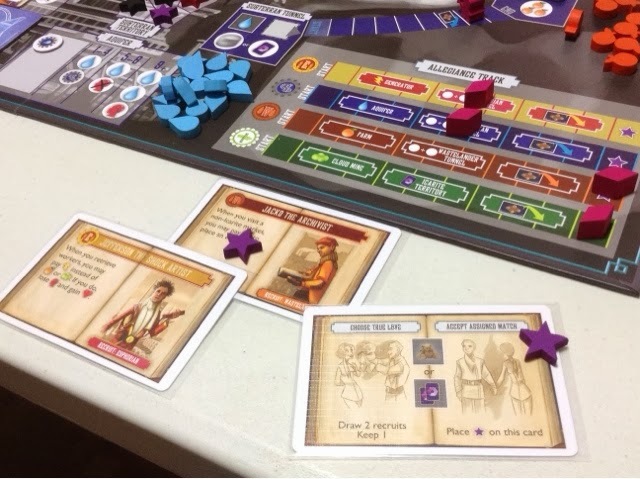 Each time a new worker is hired or retrieved from the board, the player must roll their worker/die and check for his/her workers' overall intelligence. There is an intelligence cap that once met or exceeded, one of the player's worker will escape. So you simply cannot hire and load up on workers, there is some management aspect going on where you have the ability to reduce or increase your workers' overall intelligence. As for the resource collection part of the game, it is more or less the same as you find in most other games where you place a worker to collect the indicated resources on the action space. Euphoria does implement 3 different types of worker spaces however. The first space is a communal space where any number of players may go to for resources. These are also the spaces for most of the basic resources. The communal spaces are also the only spaces where the dice value of your worker matters as a higher value worker is able to obtain more resources ( but the lower ones also offer you other tangible benefits as well ). So the benefits are subjective to the player's need. The second space is the bump space. Any player may still activate the space even if another player's worker is present. You essentially bump the worker off the space thus giving that player a free worker retrieval. The last space is the standard worker placement space. Once taken is taken. Back off. 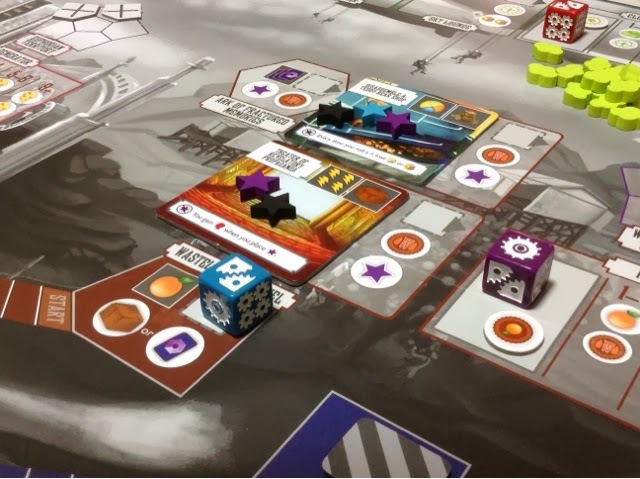 What players are doing each round is basically either placing one worker ( or more if they have the same dice value ) or retrieving as many workers as you want from the board. Placing workers involve certain costs for certain spaces ( it can be a combination of any of the 4 basic resources or 3 advance resources ) and retrieving workers have a fixed cost ( of which you may choose between 3 options ). 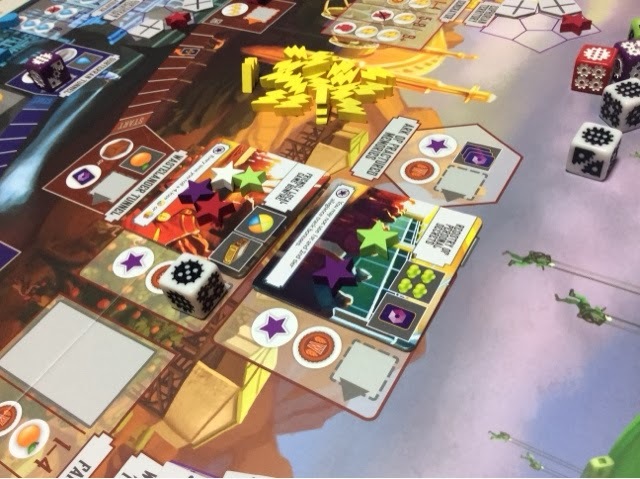 This proceeds on and on till one player manages to successfully place their 10th star on the board after which the game immediately ends and that player is declared the winner and ruler of the Dystopia. That is basically how Euphoria plays out in a nutshell. The most important aspect which i have left out are the recruits you get in and during the game. Each player starts out with one ready recruit and one standby recruit. All recruits have a special ability that the owner may use in-game. Only the abilities of the ready recruit may be used, the standby recruit has to be activated first. Standby recruits are only able to be activated when one of two conditions are met. Either the faction track marker is advanced to a certain stage, or when the faction tunnel is dug to a certain stage. These two areas get progressively advanced in the game by the players when they place their workers at different portions of the board. Most of the time, you will see your standby recruit get readied, its just a matter of how quickly you get it done so that you may use his/her ability for the rest of the game. The last thing i want to mention is the market spaces on the board. The markets are buildings that a player may build by themselves or with the help of others. The markets require the advance resources but once built, that is one star marker on the board for each player involved. Also, the players who did not build the market will suffer a penalty ( of which is unknown till the market is built ). This can range from losing resources for rolling specific die values, or to having restrictions placed on them when doing certain actions. Once left out of the building of the market, the player may still negate the negative effects but at a higher/different cost once the market is built. I have definitely not sufficiently covered all aspects of the game, but that's about most of the important points i feel that are in the game and that would give a clearer picture of the flow of the game and its multiple gameplay elements. So do i like it ? At present, i am quite yet undecided. It's a strange beast this one. I love the recruit abilities. Absolutely love them. To me its the one saving grace(?) of the game. The recruits make the game different and really shape the way you want to tackle the game. Without the recruits, this would be a bland and tasteless worker placement game of absolute efficiency where having more turns equals instant victory. But with the recruits, you get to do things outside the scope of the game. Use them wisely and victory is definitely a stone's throw away. The markets add the 2nd random element ( the first one being the recruits ) to Euphoria and it is a much needed one indeed. Which brings me to the one negative aspect of Euphoria. What really rubbed me the wrong way in Euphoria is how tight the game was designed to be. Now, i love it when games are tight. I really honestly do. But the problem with the tightness in Euphoria is that it seems artificial - it plays out the same way every game. Tight games where different strategies are employed are great. I did this, you did this, we ended up neck and neck, that was fun ! But the tightness in Euphoria is different. How so ? Well, in Euphoria, things are tight because the spaces for stars are few and thus hotly contested. But that is it. You race to put your stars at the very same place every game ( in the faction areas, the markets, your one hidden goal, and your recruit cards ). And the means to place the stars are also the same ( exchange resources, power the faction track, achieve your hidden goal ). So it becomes an efficiency game with a few random elements. But that's really it. There are no multiple strategies to win this game. You can't win by solely building markets, you can't win by only hiring recruits, you must be ( and will find yourself ) everywhere. Failing which, you will not win the game. This negative aspect may be a positive for others. But for me its quite a downer. I love multiple paths to victory. I love having to do something different each game. I look forward to playing a game a different way each time. But in Euphoria i just can't do that. I must gain resources, exchange them, use them in every way on the board and get there before someone else. That is the main point of the game. Speed. Be there first be there often. I just don't want to do that every game. I'm sorry. Viticulture is also a racing game, but you can win utilizing remarkably different strategies. I've seen people win having only shipped one order of wines, with the rest of the points from cards, buildings, and turn order points. And that's what i had hoped Euphoria to be, but it has turned out much differently. On the other-hand, for those who like efficiency games, this could be right up your alley. Its not a fast paced Dominion like efficiency which i do enjoy, but its a gradual buildup kind of game which starts slow as your abilities are less and your resource gathering benefits are not yet unlocked. But towards game end you will see who is your closest competitor and you will try to find a way to escalate your abilities or divert your resources in different ways to land those stars on the board. Regardless of whichever type of gamer you are, i still think Euphoria is worth an initial look and a second look thereafter. Because for me, even after two long looks, i still wish to explore this Dystopia a little further, just to make sure i didnt leave anything behind. Thanks for your thoughts, Jonathan. This is a really interesting analysis of Euphoria. I look at the game and see tons of paths to victory, but you're right that you're going to be getting commodities in every game, and resources and/or artifact cards. My question, though, is...are there any worker placement games where you don't have to gain commodities at some point? It seems like that's inevitable in any worker placement game (probably any Euro board game, for that matter). Thanks again for the writeup and the beautiful photos! But I think euphoria didn't fall into "my cup of tea" mainly due to the way to use the resources. Because of the areas where stars may be placed, I am going to have to be at all the different spaces. I can't really just rely on say the subterranean area of the board, cos the spaces to place the stars are simply not enough for one to win, so taking the path of building up a water engine will not be enough. I understand what you mean by the game can be different by timing your order of operations, going for certain things first or storing up or getting your standby recruit active and using both abilities longer and harder, but my issue is that eventually it comes down to the same similar areas on the board with similar outcomes. And the game is much dependent on speed, who does it faster and better. Because in most worker placement games, order of operation is already the crux of it. Something you keep in your mind at all times, so euphoria doesn't really change things up. What I do like in worker placement games is the ability to channel my resources to a certain path for victory rather than spending them on the same thing over again. In viticulture - ;) - I can win by simply only building say a medium cellar, all my other focus can be on vigorous shipping and grape selling, or I can also focus on having all the buildings and getting points through touring, selling grapes, and planting fields while maybe just making one big shipping fulfillment. So these aspects make the games vastly different each time. I still have to manage my order of operations to make sure I don't get blocked out, but what I do with my obtained resources is the key and strategic part of the game which allows me to plan out my path to victory.